This post contains affiliate links for products I highly recommend and love. I love going to the gym and then stopping at the local health food restaurant to get a Smoothie Bowl to go on the way home. It’s so delicious and tastes like a real treat, but it’s also super expensive. Making these gorgeous to look at and tasty treats at home is really very easy. My Simple Smoothie Bowls can feed just yourself or be easily doubled and quadrupled for a crowd depending on who you feed. 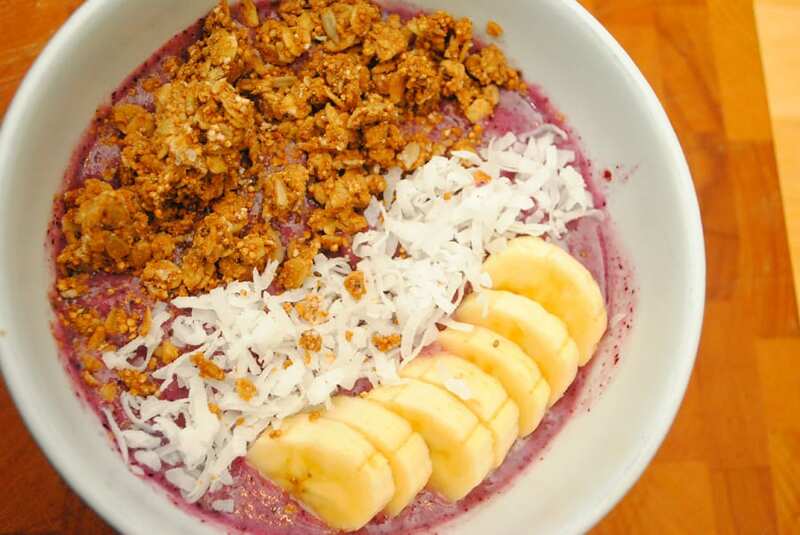 My family loves to dig into these Simple Smoothie Bowls, especially in the mornings. What I love is that each base smoothie is the same, but the toppings can vary depending on each persons preferences. My son hates granola so he just gets fruit and coconut flakes on his, while I enjoy banana, my husband doesn’t, so we leave it off of his. The possibilities are endless. For granola topping I LOVE Purely Elizabeth Ancient Grain Granola. I also love the Trader Joe’s Vanilla Almond Granola. Both are a good basic granola that let the flavors of the fruit shine. 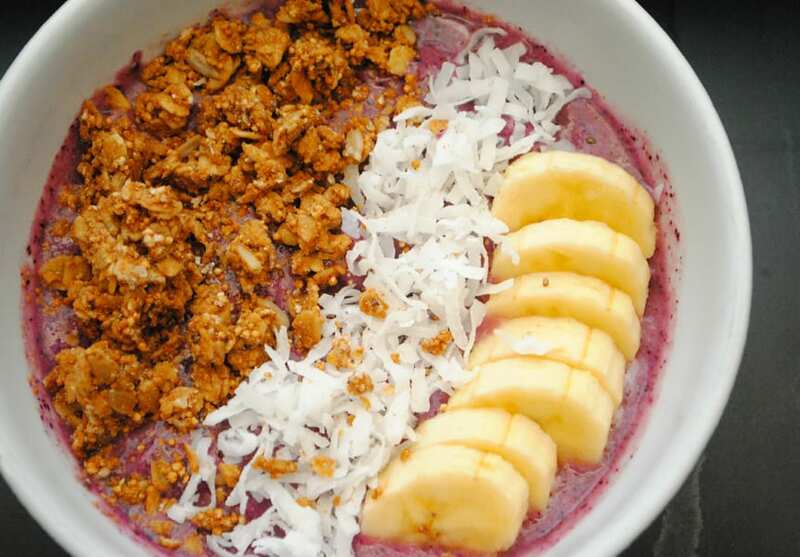 Give these Simple Smoothie Bowls a try and you will not be disappointed! Top them with slices of banana, blueberries, chopped kiwi, granola, coconut flakes, chai seeds, or slivered almonds for a healthy treat. This is for one serving but can easily be increased for a crowd. In a blender combine the frozen banana, frozen blueberries, frozen, pineapples, orange juice, and almond milk. Blend until smooth. Depending on your blender times could vary but about 45 seconds to 1 minute with a 1000 watt blender. Pour into a bowl and top with the toppings of your choice. I like 1/4 sliced banana, 2 tbsp granola, and 1 tbsp coconut flakes. Other good toppings are blueberries, and kiwi. This is for one serving. To make for more people simply increase the recipe.